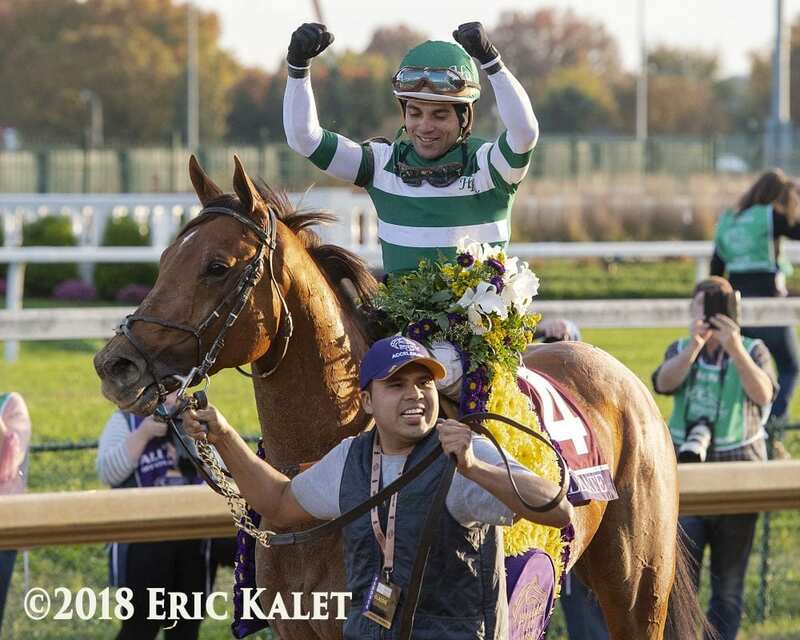 Jockey Joel Rosario and groom Alex Escobar celebrate after Accelerate's victory in the Breeders' Cup Classic. Lane's End Farm announced the 2019 stud fees for Accelerate, City of Light and West Coast. Champion older horse-elect Accelerate capped off an incredible 2018 season, which included five Grade 1 wins, with a thrilling victory in the G1 Breeders' Cup Classic. Accelerate bested 10 G1 winners in his Classic victory, earning a 105 Beyer Speed Figure in the process. Accelerate boasts 10 career wins, eight of which are graded with earnings of $5,792,480. Accelerate hails from the Smart Strike sire line and is out of the stakes placed dam Issues. He is a half-brother to stakes winners Daddy DT and Amarish and hails from the same female family as Grade 1 winner Wagon Limit and graded winner Puzzlement. Accelerate will make the final start of his career in the G1 Pegasus World Cup in January before heading to Lane's End Farm, where he will stand for $20,000 LF S&N. Lane's End will welcome not one, but two Breeders' Cup champions in January with the addition of City of Light. The Michael McCarthy-trained four-year-old looked a winner from the break of the G1 Breeders' Cup Dirt Mile and went on to a front running 2 ¾ length victory, earning a blistering career-high 110 Beyer Speed Figure. City of Light is a three-time Grade 1 winner, who has never been off the board in 10 career starts. With earnings of $1,662,600, City of Light is the top son of leading sire Quality Road. City of Light is from the female family of Grade 1-winning millionaires Cacoethes, Subordination, and Careless Jewel. City of Light will also remain in training with an aim for the G1 Pegasus World Cup in January. Following that start, he will stand at Lane's End for $35,000 LF S&N. Champion 3-year-old colt West Coast has been retired and will stand the 2019 season for $35,000 LF S&N. The dual G1 winner defeated Classic winners Always Dreaming, Cloud Computing and Tapwrit, as well as champions Arrogate and Stellar Wind during his career. The well-traveled runner finishes his career with a record of 13-6-5-1 and $5,803,800 in earnings. West Coast descends from the dominant A.P. Indy sire line and is out of champion 2-year-old filly Caressing. This entry was posted in Bloodstock, NL Article and tagged 2019 stud fees, accelerate, breeders' cup classic, breeders' cup dirt mile, city of light, lane's end farm, Pegasus World Cup 2019, west coast by Press Release. Bookmark the permalink.